Having had gsds for 20 years my question is colour related. I am about to get a solid black boy who has a bi-colour sire and a solid black dam. Pups are only days old but we did hope for a bi-colour. 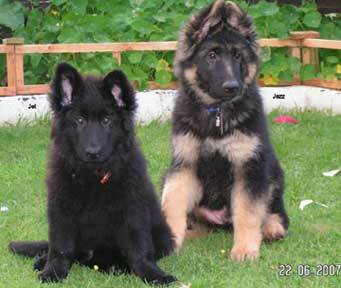 At the moment two are black but the breeder said that maybe over the coming weeks the tan can start to come through. Has anyone heard of this happening. I do not know how anyone could tell you what to expect color wise because in colored GSDs (not meaning solid white or solid black) the colors change so drastically over the course of a GSDs life. And even among litter mates colors and patterns can vary greatly. Oftentimes a single litter could easily include saddlebacks, blanket backs and even bi-colors - but you won't know who is what until they're mature. So if you're trying to choose a particular puppies color pattern as a very young puppy, good luck, but I don't think you're going to be able to do it. Besides, of all things to be concerned about in a dog, any dog, there are so many more important things to consider first - German Shepherd coat color is purely superficial. It is the temperament and health of the puppy that you should be concerned with. Let the color be at the end of your needs and it'll be a nice surprise to see what your puppy turns into from that dark little bundle most start out as. Comments for My question is about colour. Puppy booked, was hoping for a bi-colour but solid black at the moment. Could this change. Like I said had gsds for 20 years and temperament is always paramount. As we were specifically looking for a bi-colour that is why I asked the question. Blacks and near solid blacks are completely different and have no saddle to speak of so I wondered if anyone had bought a black puppy and it turned out a bi-colour. Obviously genetics play a massive part in colour so I was looking for a response with a more genetic background, if anyone can help please contact me.